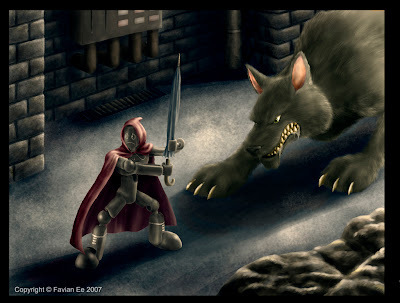 Favian's Art, Illustration and Animation: Who's Afraid of the Big Bad Wolf? I've been using Photoshop for some 10 years already, but it wasn't till a few months ago that I really learnt how to use a lot of its features. In my Digital Art course, I learnt about channels and paths, and also custom brushes, lighting and textures. They were put into good use in creating the waves in my 2008 calendar, but before that I had a lot of practice on our class assignment (see above). The assignment involved taking a photo of a STIKFAS™ figure and making it into a scene. I originally wanted to do a guy carrying a crowbar in a deserted alley at night with the shadow of a monster creeping up from the right side. However after trying it out, it didn't seem to work visually and after messing around a bit, the monster turned into a big bad wolf, and the STIKFAS™ turned into Red Riding Hood with an umbrella! I think the highlight of this piece was doing the fur of the wolf, which was backlit. This involved doing some rim lighting on the edges of the wolf (eg. the ears). The STIKFAS™ figure was completely repainted. I'm sure it can be better in many ways, but considering it was my first attempt doing something like this and that we had a deadline, and I think it turned out quite alright.